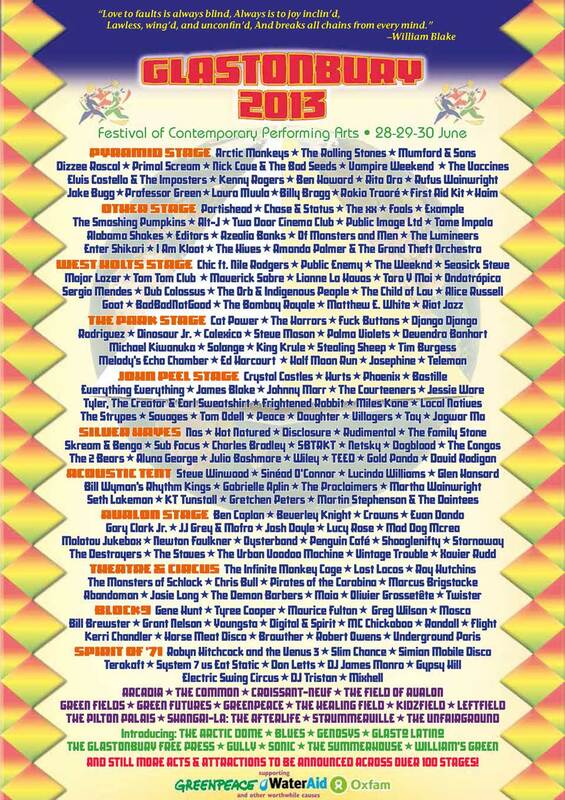 This weekend sees the world-famous musical festival in the sleepy Somerset town of Glastonbury. From out of nowhere a new city of around 180,000 people will settle down in the fields to enjoy music, dance and traditionally lots of mud. More of that later as the festival is only the latest event that has attracted people to the area. The County of Somerset is located towards the SouthWest of England and for millenia was a predominantly marshy, swampy area. Almost 6,000 years ago the first engineered road known as the Sweet Track was built across the marshes constructed like a pier (boardwalk) for 2km or 6,600 feet between two islands of dry land. 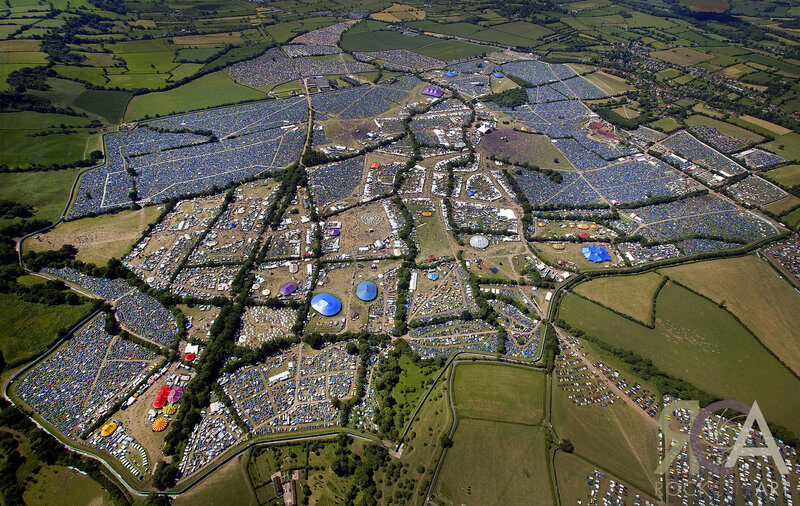 If Jesus did visit Glastonbury, he hopefully had a better map than this! 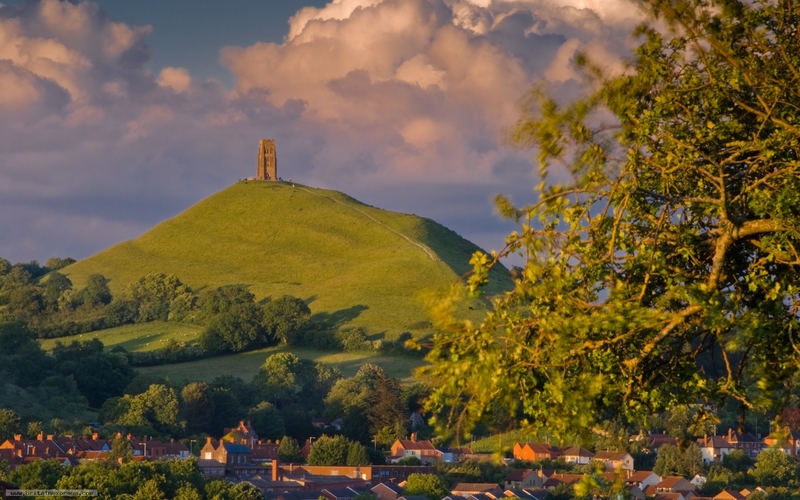 The Glastonbury area has long been a hotspot for New-Age activities, ley lines and legends. One of its most famous is that Joseph of Arimathea brought his nephew Jesus Christ to nearby Cornwall. Joseph was a rich merchant and even though Britain was not in the Roman Empire at the time, the tin from the Cornish mines were vital to the Romans and as such trade between South West England and Rome or even The Holy Land was quite common by sea. There are gaps of several decades in the life of Jesus as described in The Bible and the first history of this visit started just 3 or 4 hundred years later. In fact, there are ancient claims that Glastonbury was home to the worlds oldest Church just 5 years after the death of Jesus who it is thought if he visited England on an educational tour would have exchanged ideas and knowledge with the Druids who by chance were awaiting a special messenger called Hesus. Whilst there is no hard evidence for a visit by Jesus, there are records about this ancient Church from outside the area. It is said that Joseph of Joseph of Arimathea settled in England after the crucifixion converting people in the area to Christianity before dying here. However it is thought that these traditions were far too unorthodox for the Romans and for the later Holy Roman Church and so they were swept under the carpet and forgotten about. By ‘those feet’ of course it refers to Jesus. 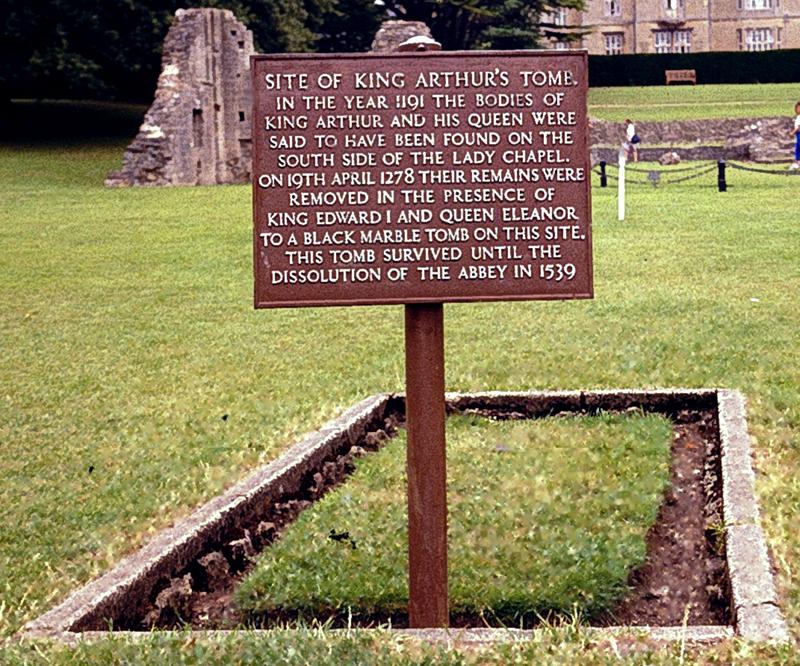 The former grave of King Arthur? For many places, it would be hard to surpass the visit of Jesus and I’m not going to argue one way or the other whether the second famous visitor equals the first but Glastonbury is also thought by many to be Avalon, the place where King Arthur came to die after meeting his foe Mordred in The Battle of Camlann. The Isle of Avalon even then was thought to have magical properties and tales of witchcraft feature quite prominently in Arthurian legend. Avalon probably is derived from the Welsh word Afal meaning Apple though it is possible it also has Cornish origins. Somerset even today is famous for its cider which of course is made from apples. Glastonbury Tor, maybe the site of King Arthurs Isle of Avalon. If King Arthur did definitively exist, it is likely that he was either a Welsh or Cornish warlord, possibly descended from Joseph or Arimathea who spent much of his life saving civilisation from marauding Danes and Saxons after the Romans abandoned the country. If so then Glastonbury does easily fit the geographic area and certainly before the marshes were drained centuries later, it would have been an island. The graves of King Arthur and Queen Guinevere were said to have been discovered by a local Abbey in the 11thC but it is thought by many that this was a fraudulent attempt to attract extra pilgrims and visitors to the town. Sadly the graves and bones were long since lost to time. 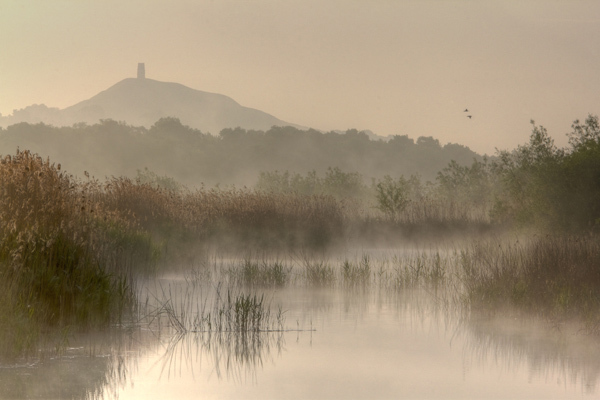 Glastonbury was an important centre in post-Roman Britain and right on past the Normans. With a history like this and being relatively close to Stonehenge, it is no wonder that Glastonbury today attracts visitors from around the world to visit both Holy, historic and mythical sites. Many of the shops are filled with New Age paraphernalia including Crystals, Druids, witchcraft, Christianity and King Arthur followers. As seen on the above photos, it is dominated by a large hill with a tower built on its summit which is almost a pilgrimage to those who visit the town. Once a year though for a long weekend, the small town of less than 9,000 souls becomes host of the Glastonbury Festival as it has done since the first hippy inspired concert in 1970. 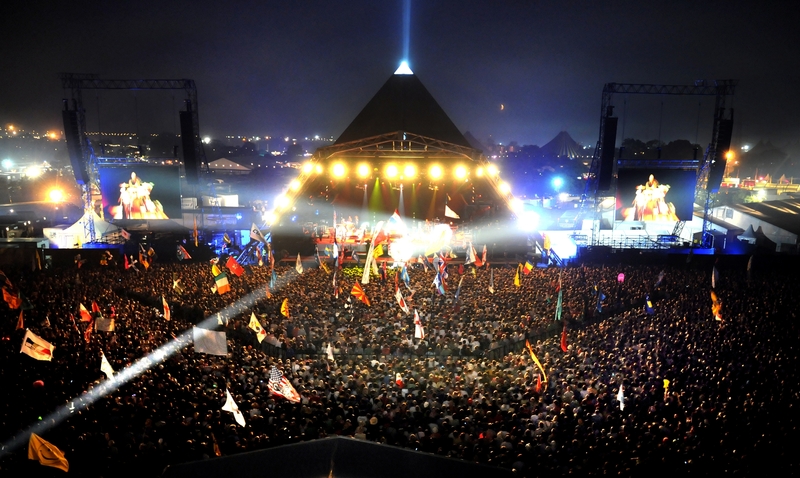 Glastonbury is just the most famous of a whole host of music festivals throughout the summer and attracts musicians from around the world to play for this unique event and in the process raise millions of pounds for charity. The Pyramid Stage where the music goes on late into the night, every night. For many years there were no police at all in the event but in recent years things began to get out of hand with there being fights between festival goers and security guards and thousands of people sneaking in without tickets forcing the construction of a huge circular barrier to control numbers. 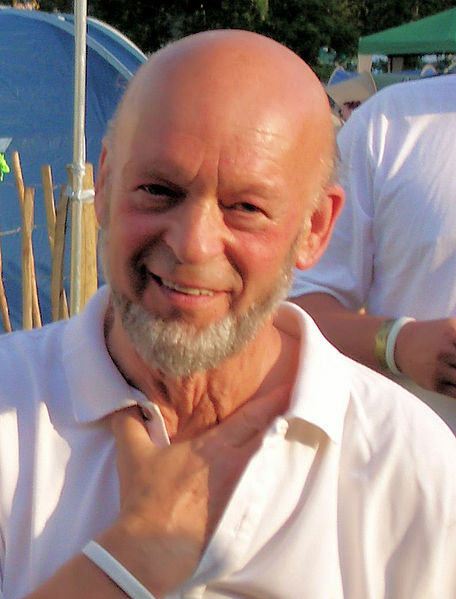 Since 1981 the festival has been organised by farmer Michael Eavis who aside from negotiating with some of the biggest names in music, also has to arrange the logistics of 1,000 coaches and 50,000 cars to what is essence just normal farming land. 11 million gallons of water are used over the weekend and as much electricity as a small city. There are numerous stages where acts perform live with over 250 speakers giving the sound system over 650,000 watts! 15,000 litter bins are emptied by volunteers who collect 1,900 tonnes of litter. The cost of clearing the site and returning it back to pasture land is about £800,000 per year and the local roads and train systems are often overloaded by visitors. It is customary for people who stay for the weekend to camp on site and there are a number of different camping areas and like a city, each area has its own unique feel and there are places for those who want a quiet life and those who want a lively atmosphere. Despite all of this there is relatively little crime except for some minor thefts or instances of drug taking. 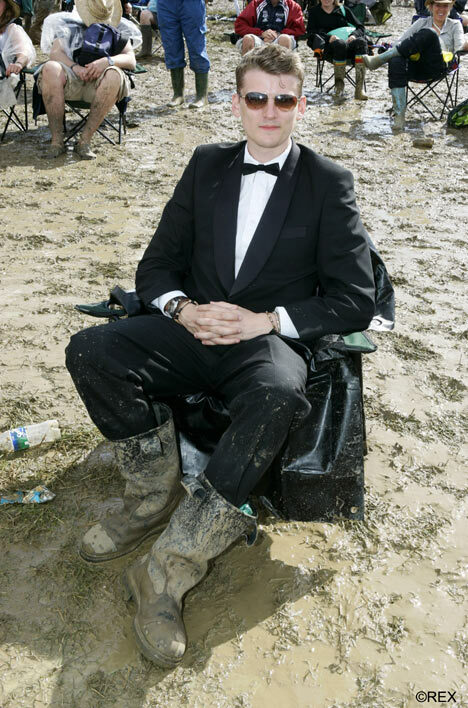 Glastonbury is famous for two things, its music and its mud. 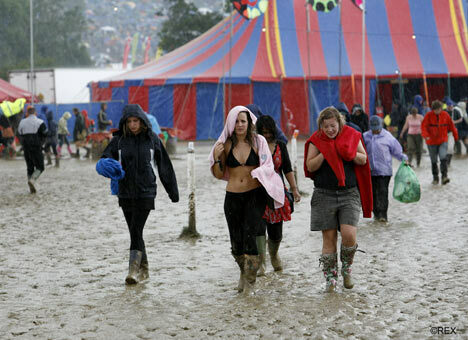 Recent climate change has meant the always changeable weather has taken a turn for the worse and for most of the last decade, the newspapers and television are full of photos of happy festival goers struggling through the mud. With 180,000 people walking through fields and sometimes non-stop rain for days on end, you can imagine the mess and often visitors just leave everything behind, others lose their shoes and boots in the mud and the crowds. Sometimes mud turns to flood… thats what happens when you drain a swamp! So it’s best to go prepared. As well as music, there are also a large number of craft activities and even some sports such as mud wrestling. Is it mud wrestling or did someone catch someone who stole their boots! Of course when it is warm and sunny, Glastonbury must be amazing. Even though the costs have gone up and its global appeal has meant that musicians outside of the traditional remit now attend the show, it still keeps its easy going, nuclear disarmament and environmental protection, hippy feel which somehow fits in with Glastonbury and its history just perfectly. Maybe now would be a time to construct another wooden road like the one 6,000 years ago but where would the fun in that be? These girls have come prepared because even though it starts like this…. with all those people, it can soon turn into this. Much of the festival is screened live in Britain on various BBC Channels. Each year the festival attracts new and classic acts and as the listings for this year show, the Headline Act for Saturday night in 2013 will be The Rolling Stones. This entry was posted in history, Popular Culture, Religion and Faith and tagged Avalon, Culture, Druids, Glastonbury, Glastonbury Festival, Glastonbury Tor, history, Jesus in England, Joseph of Arimathea, King Arthur, Life, Mud, Music. Bookmark the permalink. I suspect I’d rather watch it on TV… 🙂 Not really into mud wrestling. Interesting article. Yes, me too. I watched it on TV last night. 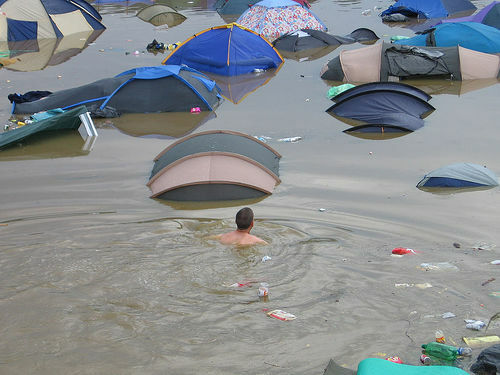 If I want to camp, it would not be with 180, 000 people in a muddy field. I wouldn’t mind visiting the old town though. Very interesting and amusing post. 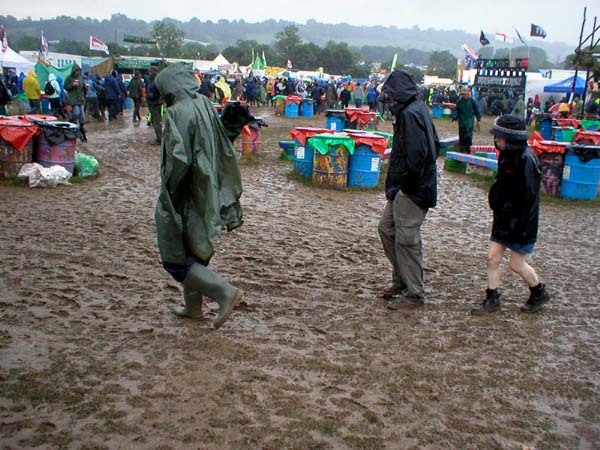 I would love the music festival, but i don’t know about the mud wrestling either. That used to be very big here in the south and I could never really quite get into it. Around here it is seen as a sort redneck sport, especially for women. I’m glad you enjoyed the post. I think mud wrestling especially for women is the same over here. By all accounts this years music festival is one of the best in 43 years. No rain yet either! Interesting concept of Joseph taking Jesus to Great Britain. There are many possibilities for the time not accounted for in the Biblical version, but I had never heard of this one. I like to explore history and looks like you have an inteesting site. It’s an established tradition here though with no real hard evidence except for the fact that nearby Cornwall had good quality Tin and traded with the Romans long before Britain became part of the Roman Empire. There are also lots of local stories and legends but I don’t know them well enough to say how likely they are to be true. Thanks for visiting, I hope you enjoy coming back!